Today i am posting short review for http://www.binary.com. I am trading with this broker for last 3 months with no any kind of trouble. They have all kind of binary types trading and 85% payout,minimum trade size,many kind of deposit method,min.deposit $5,instant deposit after payment,very good support. Founded in year 1999.also provide binary education and bonus too.provides demo account for test your trading strategy,indicator(apply on mt 4). Best of all same day withdrawal,you get money in 4 hours. So my rating to http://www.binary.com is 5 star. I have been using binary.com for the past 2 years and I would say this is the best broker i have signed up with. They have a very good user friendly platform with highest payout for all assets. The minimum deposit required is only $5 and the minimum trading amount is just $1. The Volatility Indices are available trade on all 7 days of the week and the minimum required for the tick trades in only $0.35. The withdrawal process has never been a problem for me. The funds gets transferred to my Neteller account within 4 to 5 hours from the Withdrawal request time. To finalise, I would recommend this broker to everyone and can assure that you will have a great and happy experience in trading with their platform. I’ve been with “Binary com” for 8months. So far, so good, it’s a great broker with FAST WITHDRAWALS. Great demo platform of $10,000 for anyone interested. They definitely have my 5-star rating, non-negotiable! I’ve been with “Binary com” for 1 year. Best broker i have signed up with. I have withdrawn more than $ 10,000 with no problems. 5 star definitely. Binary.com – Binary.com boasts to be one of the earliest brokers, established in 1999. It was first established as a gambling entity, hence, it is mostly licensed and regulated by gambling regulation bodies. Binary.com regulation includes; MFSA (Malta Financial Services Authority), IOM (Isle of Man Gambling Supervision Commission) and the UK Gambling Commission. Binary.com also boasts offices in Malta, Malaysia and Japan. Up/down; The trader selects whether the price of the option will be above the entry point or below the entry point at expiration. 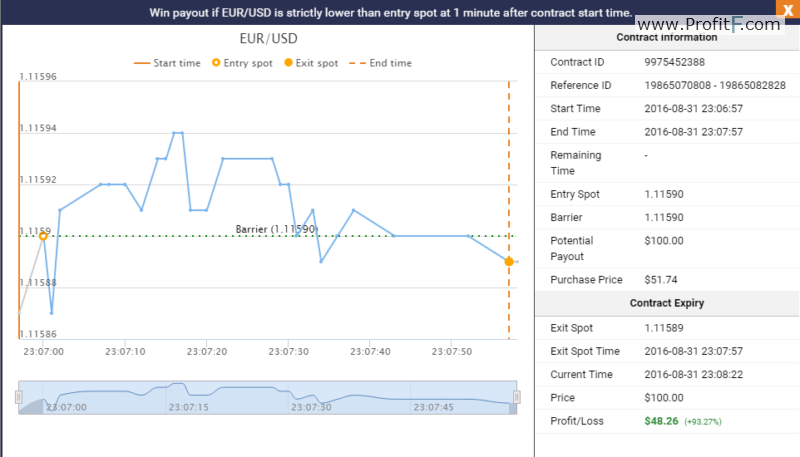 Touch/no-touch; The trader selects a barrier/price and predicts whether the option will touch or not touch that barrier before the expiration time. Stay in/ Goes Out; In this option, the trader has to select two barriers/prices; a high barrier and a low barrier and predict whether the price will stay within the two barriers or break-out. Unlike most binary options brokers; binary.com lets you either choose the expiration period (duration), or the end time of the option. 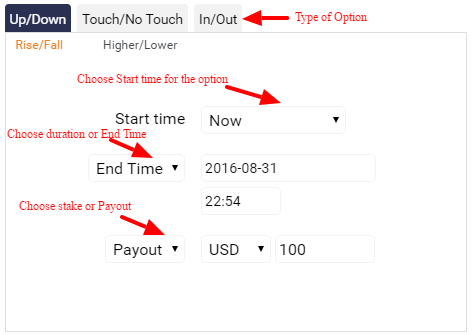 One is also able to select the starting time and date of the option as well. More flexibility is given to the trader by enabling the choice of either stating the stake/bet size or the preferred payout. A wide range of assets is available on Binarycom ranging from Forex pairs, Indices, Commodities and Stocks. These can also be easily selected from the trading platform. One can also view the type of option available for each asset as well as available durations and end times. One can also see the closing time and opening time of assets available on Binary.com. This is mostly resourceful for stocks and indices since they have different trading times. Trades are placed as easily as selecting the preferred trading conditions as explained above in the trading conditions sections and then purchasing the option. The platform auto-calculates and displays the net profit expected as well as the percentage return on investment. 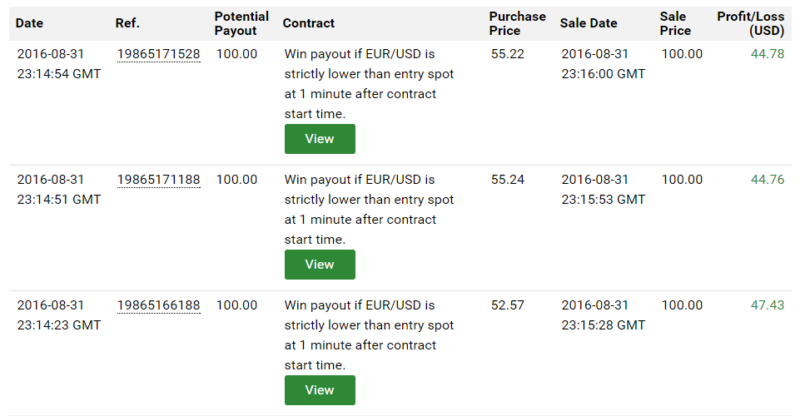 One unique advantage Binary.com has over other binary options brokers is that once a binary options contract is selected; one can read its explanation on how to win or lose before even purchasing the contract. This is very helpful for newbie traders to understand the different option types available. The view button on the historical transactions section opens up more details on a specific transaction including the trade chart at the time of trading. This enables traders to view past trades and learn from mistakes while building on strengths. More charting tools can be accessed by using Binary.com’s webtrader. Multiple chart types including; tick, candlestick, OHLC, line, dots, line dot, spline and table. Binary.com has huge learning resources ranging from webinars, ebooks, trading videos, newbie section, daily and weekly market updates, and a commodities trading corner which also has resourceful videos. 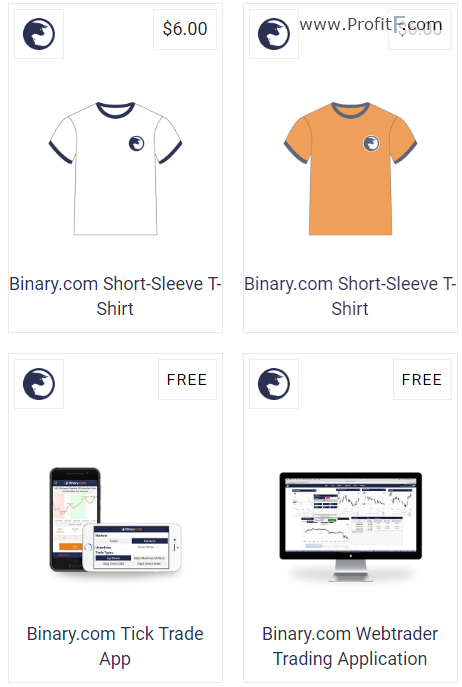 A shop is featured on binary.com with paid and free products ranging from applications, apparel, and trading guides. Having been founded ahead of most binary options brokers, Binary.com has had a lot of time to innovate and increase its resourcefulness towards traders. From the trading conditions, support and the trading platform; Binary.co exudes excellence. Now, everything seems OK with Binary.com broker. ProfitF will keep monitoring this broker and update this review if any changes take place.